People for the Ethical Treatment of Animals (PETA) is known for its shameless attempts to generate press, no matter how much the public can’t stand its antics. PETA’s President Ingrid Newkirk has even admitted that this is a major part of its animal liberationist strategy, once saying, “we are complete press sluts.” What PETA doesn’t like to admit (besides the fact it has killed over 33,000 animals since 1998) is that those exploited by PETA for press attention occasionally bite back. Enter YouTube User “oicthatu812” and his cat. He made a completely fake and harmless video of his pet cat, Tator-tot, being “shocked” by his toothbrush using the magic of computer graphics. Like most cat videos, it had no agenda nor malice. Everyone got the joke except (you guessed it) PETA. 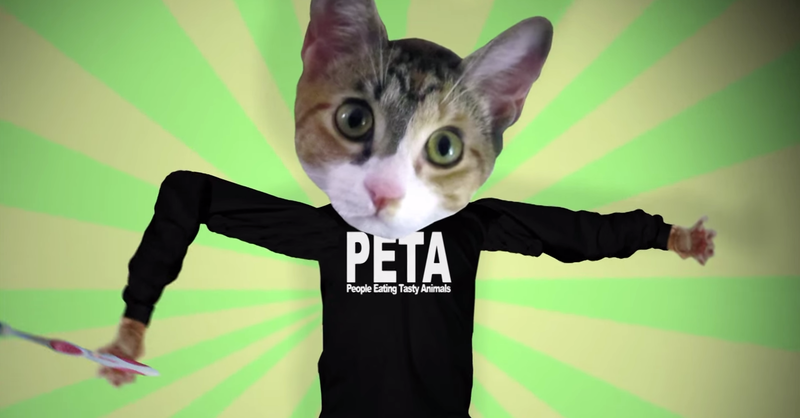 Springing into outrage faker than the video itself, PETA emailed the creator threatening an official complaint and demanding the the video be immediately removed. Deciding he wasn’t going to cower to PETA’s intimidation tactics, he made a response video… and we think it’s great. Check it out below. But while the YouTuber’s “shocks” were completely fake, PETA does real harm to cats and dogs. PETA kills an average of 6 animals per day at its “shelter” and maintains a near 90% kill rate, and PETA officials have suggested that stray cats are better off dead than alive—even if fixed. Most individuals who are used as arbitrary props in PETA’s PR battles don’t have the opportunity to fight back against PETA’s faux self-righteousness. At least in this case, we should take comfort in knowing that someone told PETA that its moral compass wasn’t facing true north. If you’d like to learn more about PETA’s radical agenda, visit https://www.petakillsanimals.com/ and stay updated on Facebook (https://www.facebook.com/PETAKillsAnimals) and Twitter (https://twitter.com/peta_kills).